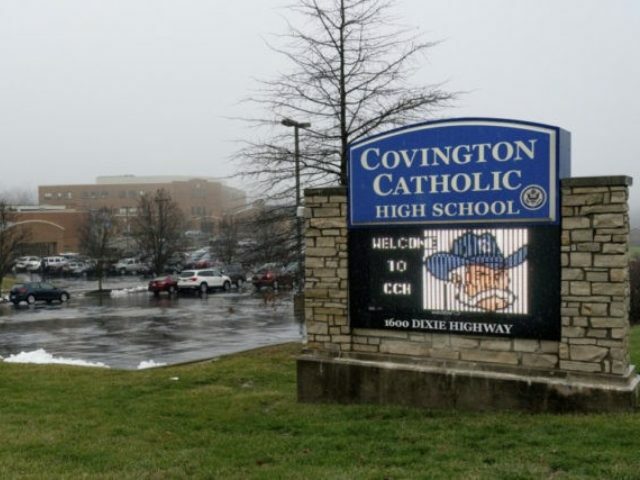 Covington Catholic High School in Kentucky is still reeling from the encounter between some of its students and angry black and Native American activists in Washington, DC, last weekend. As a result, Friday’s basketball game against a local rival has been postponed. Covington Catholic High School’s website is still offline, but Holmes High School posted a statement on its website, according to WCPO television in Cincinnati. “The Friday evening basketball game between Holmes High School and Covington Catholic High School has been canceled and will be played at a later date,” the statement said. “With passions running high relating to the incident in Washington, D.C. this past weekend, officials from both schools agreed that it would be best to postpone the game. Nick Sandmann, the student at the center of the controversy, has responded to the claims. Sandmann has issued a statement, spoken with the media, and his family has hired professionals to help them cope with the onslaught of criticism and threats. WCPO implied in its reporting that the family is using resources that may not be available to others seeking legal and other advice or have a political bias. “Sandmann’s family has since contracted Kentucky’s largest public relations firm and a Georgia attorney known for aggressive libel and slander suits against media organizations,” WCPO reported. Covington also delayed opening the school until Tuesday after the weekend debacle, citing safety concerns for the students.